Camp Hill served as an encampment for many troops including both Union and Confederate. At first, the armies were located in the bottomland, but because of the high amount of sickness, the men were moved to higher ground. Don’t be surprised if you hear the drums of soldiers on High Street or hear the sounds of marching feet! They once paraded the streets and their ghostly procession is still heard today. 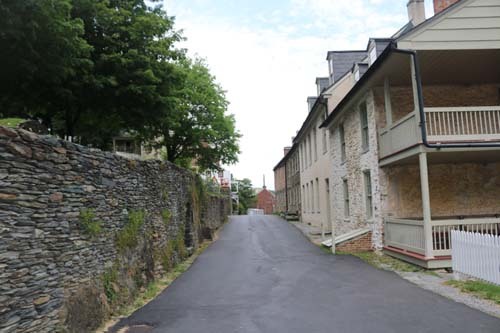 You can take the 10 minute walk up Washington Street from downtown Harpers Ferry and up the hill to Bolivar Hieghts where Camp Hill was located, and even just a bit farther where the Civil War Battle of Bolivar Heights (October 16, 1861) was played out. Because they say the ghostly procession doesn't end there. 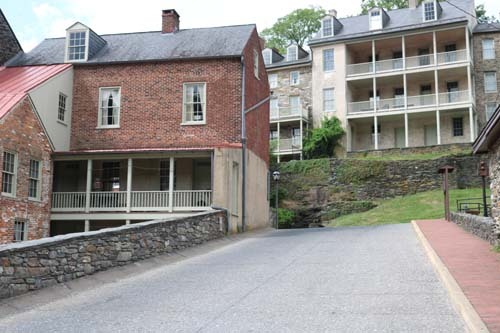 Folks walking through the town overlooking the older section of Harpers Ferry have reported ghostly soldiers just about everywhere. 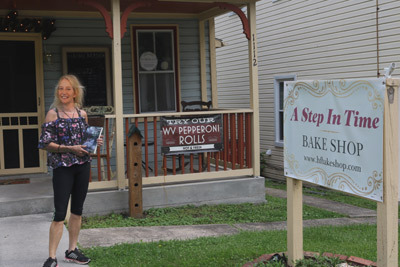 hfbakeshop.com)- a bakery and coffee shop offering award-winning Mama Jo's Pepperoni Rolls (freshly baked by a super warm and friendly Terri Wilson, owner). It's my favorite place to visit in the whole place! You can dine on pastries to die for-and you can ask her about the mischievous ghosts who help her in the kitchen! All the treats are made fresh daily. And you may find my books there! 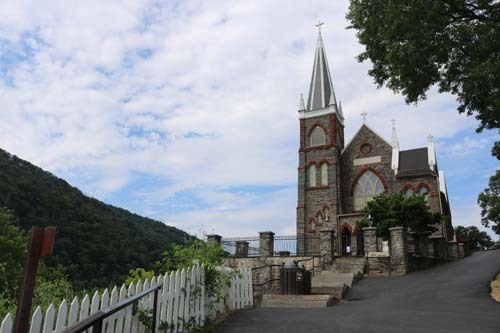 St. Peter's Catholic Church has been a powerful icon above the city of Harpers Ferry since its completion in 1833. There is no doubt the deeds of those who worked inside its walls were just as prominent. One such person was Father Michael Costello, the priest at St. Peter’s from 1857 to 1867. He would find himself in the center of battle when he was only 28 years-old, not only during the raid by John Brown, but later when he stayed in the city during the Civil War. His ghost is said to be seen walking around the church. There is also a soldier who has been seen on the steps in front. During the civil war, the young man lay on the lawn of the church when it was used as a hospital, mortally wounded but waiting for the doctor to see him. As the blood drained from his body, he was finally carried inside. Those around him heard his guttural whisper just as he came through the threshold of the church: Thank God, I am saved. To this day, visitors standing near the church can hear those very words the soldier whispered softly just before he died. 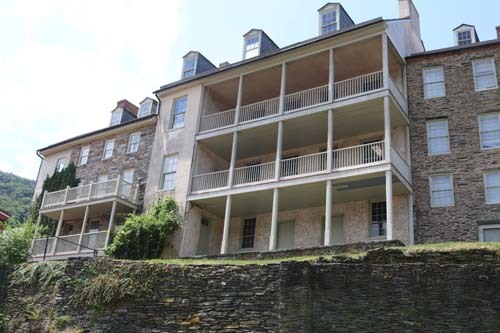 In the late 1700s, Rachel and Robert Harper built a home high atop the hillside in Harpers Ferry and ran a ferry service. The business did quite well before the Revolutionary War, but they were forced to pay outrageous taxes to England. Such, Rachel hid much of the money in jars to avoid paying the fees. During normal household duties in 1780, 60 year-old Rachel fell from a ladder. She died the next day without telling anyone, even her husband, where the money was buried. In 1782 and at age 64, Robert Harper died a widower with no children. The money was never found. Some believe the money is hidden in the garden across from the old home. Rachel, wearing the clothing of the 1700s, is seen peering in that direction from a window overlooking her garden, still keeping a watchful eye on her money. John Brown was raised in a deeply religious family who passionately opposed slavery. Despite his seemingly spiritual background and his desire to support human rights, his antislavery tactics were quite radical and violent. 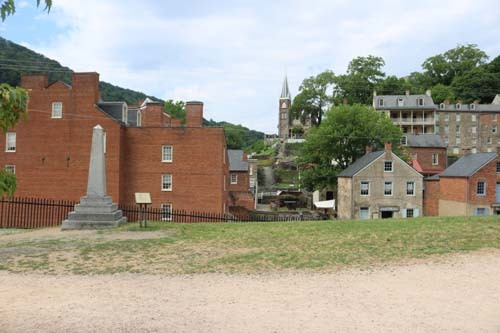 On the night of October 16, 1859, 59 year-old John Brown led 21 men, including two of his sons, on a raid to seize the U.S. Arsenal at Harpers Ferry where the Shenandoah and the Potomac Rivers meet. His goal was to use the guns to create an army of former slaves that would incite a rebellion to free all slaves. He took citizens of the town hostage as the rebellion came to its peak, but Brown's escape route was cut off. During the raid, six citizens of the town were killed including the mayor and a black railroad baggage handler, Hayward Shepherd, who came upon the men outside town. In all, ten of Brown’s men were killed and seven were wounded and captured. Although Brown did not die in the insurrection, he was tried and convicted of treason. He was hanged on December 2, 1859. His ghost is said to appear along the streets in town, a full body apparition that appears like a reenactor dressed in costume. Where John Brown's Fort once stood. An elderly woman, who was fondly called Jenny by those who watched her make her way along the river searching for driftwood for her fire in the tiny shack by the waterway, haunts the trailroad tracks. One night, after tending to her fire, Jenny’s dress slipped into the embers and the hem burst into flames, quickly consuming her body. She ran frantically along the tracks and toward the river screaming for help. But in her desperate attempt to escape from the flames, Jenny didn’t see the evening train coming and it hit her. Engineers since that time coming down the railroad tracks have reported seeing a huge ball of flame rolling along the tracks. It is followed by a scream as loud as the train wheels screeching across the iron rails, the ghostly reminder of an old woman who lived a humble life and died a horrible death along the Harpers Ferry train tracks. In a desperate attempt to free his beloved wife and child from slavery before they were sold, Dangerfield Newby, a freed slave, joined John Brown's rebellion. A heart-wrenching letter was found in his pocket sent by his wife begging him to find a way to free her. During the raid, Dangerfield was killed with a spike in his neck. So outraged at the assault on their town, citizens later took Newby’s body and repeatedly stabbed it and amputated the limbs. His body was then tossed into the alley to be eaten by hogs running the streets. Now, that alley is called Hog Alley. Mister Newby's ghost has been seen wandering down the small street. He dons a horrible scar across his throat and appears to be focused hard upon the ground as if he is still trying desperately to find a way to free his wife and child. 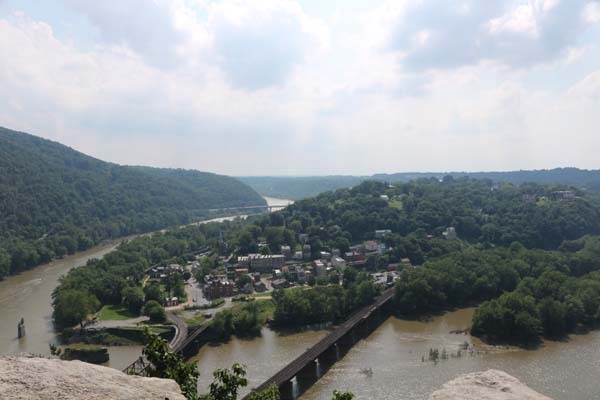 If you're in shape, you can rub elbows with the soldiers, too, by hiking the Maryland Heights trail just across the river. 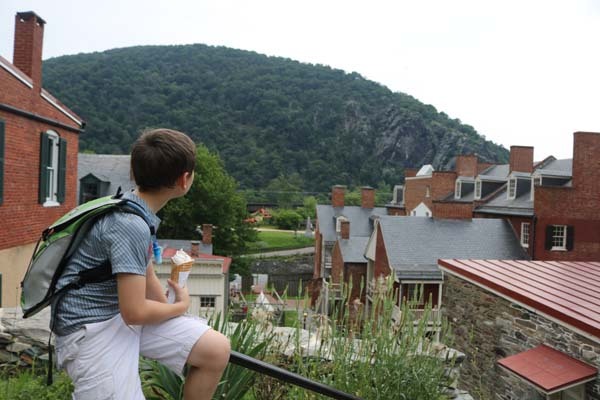 The trail follows the path of hundreds of soldiers battling during the Civil War over the prize of Harpers Ferry. Tiny ghost firelights have been seen along the mountain. It is a difficult trail along a steep mountain, 4.5 or 6.5 miles round trip, 3 to 4 hours. It took us a couple hours up the mountain, then down the same side. 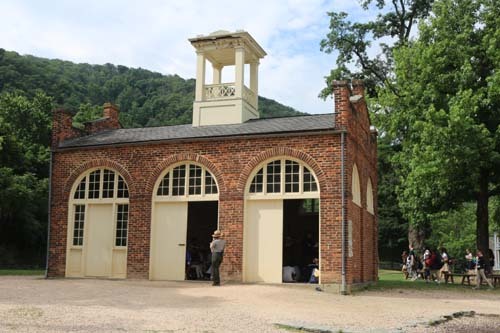 You start at the information center in Lower Harpers Ferry (just past John Brown's fort at the dead end of Shenandoah Street). Cross the footbridge paralleling the railroad tracks over the Potomac River. Turn left after you descend the stairway and follow the C&O Canal Towpath for 0.3 miles. There, you will see a footbridge over the canal. Signs will lead you across the road to the trailhead. 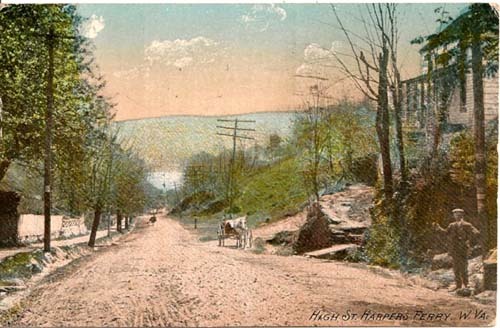 Watch for cars-the road is still used. The National Park Services gives these directions: "The first bend on this green-blazed trail offers a nice view of the Potomac. Go straight at the first intersection to a see the 1862 Naval Battery, then return to the green-blazed trail and turn right. At the next two intersections stay straight on the red-blazed Overlook Cliff Trail. About 0.3 miles turn right for a narrow, rocky descent 0.5 miles to the cliffs overlooking Harpers Ferry. Backtrack to the first intersection with the blue-blazed Stone Fort Trail. Hike one mile uphill past Civil War artillery batteries and through boulders to the Civil War Stone Fort. The trail curves out of the Stone Fort past breastworks and descends steeply over one mile back to the green-blazed trail. 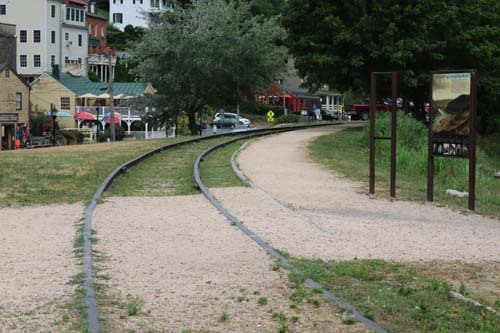 Turn right and backtrack to the C&O Canal Towpath." 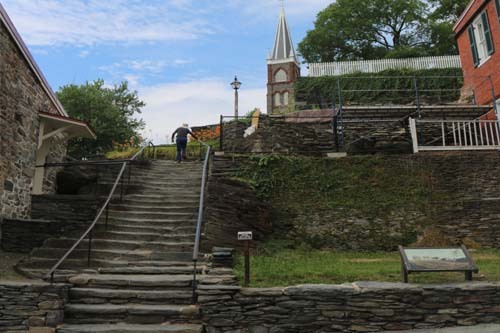 You can take a short walk to the most haunted places in Harpers Ferry below. 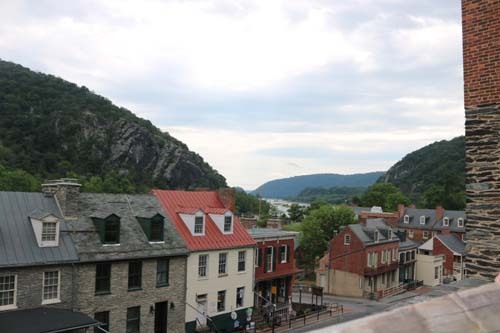 There are also ghost tours of Harpers Ferry. Phone: (304) 725-8019 They are open year 'round offer tours Mondays through Saturdays.